A pilot scheme to test offenders as young as 14 for class A drugs, in a bid to give them swift treatment for their habit, begins on Sunday. Youths in 10 pilot areas across England will be obliged to take part in the testing if charged with offences such as burglary, car theft and begging. They will be tested for heroin, crack and cocaine and anyone who tests positive will receive specialist help. 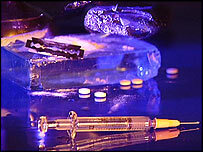 The Home Office hopes the scheme will help break the crime-drugs link. Courts will be able to take test results into account when sentencing. Drug support groups said in order to succeed the idea needed to be accompanied by appropriate treatment. The pilot expands an existing scheme introduced three years ago to drug-test adults. Fourteen to seventeen year-olds who are charged for a "trigger offence" such as burglary, car crime and theft, will be tested. The Home Office pilot is being run by the Metropolitan Police in three London boroughs - Camden, Newham and Southwark. Commander Alf Hitchcock, in charge of Criminal Justice for the Met, said: "Drug testing young offenders in these circumstances is an excellent first step in stopping many young people from slipping into what is essentially career criminality. "We believe that if you can remove the root cause for crime you can stop the crime from being committed." He said the young people from the three London boroughs who test positive for class A drugs will go onto specialist drug treatment programmes. In announcing the scheme earlier this week, Home Office Minister Caroline Flint said: "We know that young offenders are more likely to use drugs than other young people. "We need to intervene and stop class A drug abuse as early as possible." UK drugs information charity Drugscope warned that any testing had to be backed up with investment in prevention and treatment. Martin Barnes, chief executive, said drug testing could be effective to pinpoint those at risk of future drug misuse, but he warned that the "limits" of using the criminal justice system had to be considered.